A high resolution histology image of lung tissue (background), and the tree-like respiratory system. Lungs allow us to breathe - to take in oxygen and release carbon dioxide. Yet despite an existential importance, the development of the lungs and the rules governing the process that enables respiration are still not well understood at the molecular level. Of equal importance and high clinical significance is early lung development, with "early" defined as from around four months before birth through 24 months after birth. This stage of development is crucial to the lifelong health of an individual and remains the most critical factor in newborn viability. It also has significant implications in reducing the high mortality rate that characterizes prematurely born infants in the United States. For these reasons, expanding the understanding of early lung development is a critical step toward promoting proper lung formation in preterm infants. To fill these knowledge gaps, a cohort of PNNL scientists is using advanced mass spectrometry tools to perform a systematic characterization of normal lung development in mice and humans as part of the LungMAP Consortium funded by the National Heart Lung and Blood Institute. Two recent papers from the PNNL LungMAP Research Center, which is directed by Charles Ansong, represent road signs along the way to progress. One, led by staff scientists Geremy Clair and Paul Piehowski, used a novel platform for ultrasensitive analysis to characterize, for the first time, the ontogeny of protein changes during normal lung development in minute microdissected alveolar tissue. The second paper was authored by then-PNNL post-bachelor's student Sydney E. Dautel (a precociously talented researcher now in medical school) and her mentor, staff scientist Jennifer Kyle. It used lipidomics to reveal dramatic lipid compositional changes in the maturing postnatal lung. In the paper by Dautel and Kyle, published in Scientific Reports in February 2017, scientists at PNNL and the University of Washington performed the first unbiased profiling of lipids (i.e. lipidomics analysis) during normal lung development. Lipids play significant roles in the lung, such as in pulmonary surfactant, which decreases surface tension and prevents lung collapse. However, many of the roles of specific lipid species in normal lung development are not clear. They also showed the first direct evidence for dramatic global alterations in the lipidome across developmental stages, and corroborated their results with corresponding changes in relevant proteins and metabolites. This multi-omics view revealed several insights, including into sphingolipid-mediated apoptosis, inflammation, and energy storage and use. Overall, said Kyle, the study provided a rare "deep and comprehensive view of the lung lipidome during normal development." While the paper by Dautel and Kyle examined whole-lung samples, the paper by Clair and Piehowski focused on analysis at a much finer resolution by looking at microdissected alveolar tissue. "Alveoli represent the fundamental unit for gas exchange - that is, breathing - and play additional critical roles, such as the production of pulmonary surfactant, a fluid that decreases surface tension and prevents lung collapse," said Clair. "Here we are looking at a very specific region of the lung instead of the whole lung, providing a more refined understanding of the processes driving normal lung development." From time-points roughly equivalent to early lung development in humans (in-utero mice at gestational day 16.5 and mice at postnatal days 7 and 28) they examined minute microdissected alveolar tissue representing only 4,000 lung cells. Impressively, their ultra-small scale analysis allowed characterization of more than 3,400 proteins, providing the first in-depth global characterization of the ontogeny of protein changes in microdissected alveolar tissue during normal lung development. "Our work and results revealed that a complex network of temporal regulatory control directs normal lung development," said Clair, "with epigenetic regulation fine-tuning pre-natal developmental processes." The paper is largely a celebration of what Piehowski called "nano-proteomics," a method of analysis that allows interrogation of samples that contain sub-microgram protein amounts, such as spatially defined regions and/or the cell types from tissues. Such spatially-resolved analysis is increasingly recognized as essential to gaining a deeper, more refined understanding of complex biological processes. The nano-proteomics workflow utilized in this paper and developed by Piehowski is particularly exciting when compared to the current state-of-the-art nano-proteomics workflow. That's because it provides significant improvements in throughput (five times faster) and in quantification (a two-fold lower variance). Being able to observe the ontogeny of protein changes for more than 3.400 proteins "is very good for such a small sample," said Clair. "The method is really novel." What's next? The research team is in the process of extending to human samples the advanced omics approaches it pioneered with mouse samples. "Our next step is to apply our refined approaches to precious human samples," said Ansong. 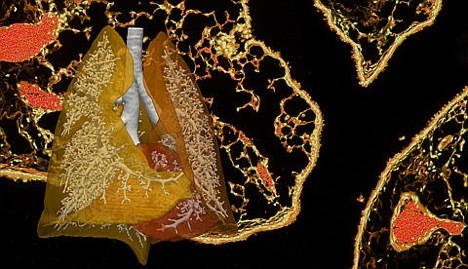 Using a multi-omics approach in both whole-tissue and region-specific tissue analyses will provide a unique, multi-scale molecular atlas of the developing human lung. Sponsors ("Lipidomics reveals"): This research was supported by a grant from the National Heart Lung Blood Institute of NIH. Sponsors ("Spatially-Resolved Proteomics"): Portions of this research were supported by grants from the National Heart Lung Blood Institute of NIH and by the National Institute of General Medical Sciences of NIH. User Facility (both papers): EMSL, the Environmental Molecular Sciences Laboratory, a U.S. Department of Energy Office of Science user facility at PNNL. PNNL research team ("Lipidomics reveals"): Sydney E. Dautel, Jennifer E. Kyle, Geremy C. Clair, Ryan L. Sontag, Karl K. Weitz, Anil K. Shukla, Son N. Nguyen, Young-Mo Kim, Erika M. Zink, Teresa Luders, Julia Laskin, Thomas O. Metz, Richard A. Corley, and Charles Ansong. PNNL research team ("Spatially-Resolved Proteomics"): Geremy Clair, Paul Piehowski, Eric Huang, Erika Zink, Ryan Sontag, Danny Orton, Ron Moore, Richard D. Smith, Richard A. Corley, and Charles Ansong. Dautel, S.E. et al., "Lipidomics reveals dramatic lipid compositional changes in the maturing postnatal lung." (2017) Sci Rep. 7: 40555; DOI: 10.1038/srep40555 (2017). Clair, G. et al., "Spatially-Resolved Proteomics: Rapid Quantitative Analysis of Laser Capture Microdissected Alveolar Tissue Samples." (2016). Sci Rep. 6, 39223; DOI: 10.1038/srep39223 (2016).